What do we mean when we say that something is morally wrong? Theists have no problem answering this question: morally wrong acts are those that contravene God’s intentions for how human beings ought to behave. Non-theists, however, are stuck with more of a problem in defining what “morality” and “ethics” (I’m using the terms interchangeably) are. Our conceptions of morality need grounding in some larger conception of what life is all about, and it’s here where contemporary non-theistic attempts to ground ethics are most likely to founder. Other post-Enlightenment Western philosophers, seeking a more solid ground than emotivism in which to root moral statements, have successively tried — and failed— to ground morality in either rationality (Emmanuel Kant’s “categorical imperative”) or utility (Jeremy Bentham’s “greatest good for the greatest number”). Contemporary Scottish-born philosopher Alasdair MacIntyre suggests, however, that all philosophical efforts to ground morality in something other than sentiment are doomed by our modern commitments to a secular, scientific view of Nature which excludes meaning, purpose, or telos from its materialist description of the way things are. MacIntyre argues that David Hume’s famous dictum that there’s no way to logically get to “ought” statements from “is” statements is, strictly speaking, not true. For example, if a watch always tells the right time we can reasonably conclude that the watch is a “good” watch. We can conclude that the watch is “good” because the very definition of a watch tells us what a watch is for. Watches, by definition, have a purpose; they are “for” something. Things that conform to and fulfill their aim can be said to possess “goodness” in a way that’s based on more than sentiment. Classical philosophers like Aristotle, and medieval philosophers in the Aristotelian tradition like Maimonides and St. Thomas Aquinas thought that human beings, too, had a purpose. For Aristotle it was a telos or “final end” intended by Nature — man’s telos was fulfilled by developing one’s intellectual and moral virtues so as to achieve a state of eudaemonia, often translated as “human flourishing” or “well-being.” For St. Thomas, man’s purpose was to live in accordance with God’s intentions for who we are to be and with Natural Law as established by God. Modern science, however, doesn’t countenance the belief that Nature possesses final ends, purposes or intentions. Within the confines of science’s world-view, moral statements are left hanging in air, ungrounded in anything that might make them intelligible. Moral statements, to mean anything, must have some standard that lies beyond mere sentiment and preference because different human beings believe and express a diversity of conflicting sentiments and preferences, and this diversity of sentiments precludes any rational means of resolving moral disputes. Without an external standard, Hitler’s moral judgments are no better or worse than your own. Contemporary American philosopher Thomas Nagel argues that the consensus scientific account of how we came to be cannot account for three essential human qualities: consciousness, reason, and value. He suggests that only some combination of panpsychism and telos can account for how we humans got to be the way we are. He believes that consciousness must originate in some form of panpsychism, and that, additionally, something about the laws of Nature must not only permit, but also encourage the timely emergence of increased complexity, consciousness, reason, and value. Nagel believes that Nature has a story to tell, and that it’s something like “the universe is waking up.” Nagel’s controversial book, Mind and Cosmos (2012), was widely criticized, but it’s really a modest exploration of the kinds of problems the current scientific paradigm is incapable of successfully resolving. As humans we’re, first and foremost, conscious beings, and our consciousness is riddled through-and-through with intentions, purposes, motives, and reasons; the kinds of things that Nature is allegedly devoid of. Value is an immediate property of consciousness. We immediately perceive a sunset as “beautiful”; we don’t need to think it over. We immediately understand that the statement “there’s no unicorn in this room” is “true”; we don’t need to reason it out. We immediately know that rescuing a child who’s fallen into a well is “right”; we don’t need to morally deliberate over it. While reason shapes and extends our immediate intuitions about beauty, truth, and goodness, and while we seek logical grounds for resolving value conflicts, our initial perception of value is inherent in consciousness itself. It’s a phenomenological given. That’s not to say that morality existed prior to human consciousness. No one accuses lions of immorality for killing their prey. But once human consciousness arises, beauty, truth, and goodness come along for the ride. While our specific apprehensions of what’s beautiful, true, or good change from culture to culture, era to era, and across one’s lifespan, the value realms of Beauty, Truth, and Goodness universally persist, in much the same way that languages may vary from culture to culture and era to era, but Language itself is a human universal. Evolutionary biologists wrongly believe they’ve a good candidate for a mechanism that can account for the emergence of morality. They point out that social animals like ants, wasps, and humans are among the most successful species on our planet. They say that sociality conveys evolutionary advantages that allow Nature to pay a premium for the modulation of in-group competition and the enhancement of in-group altruism. As compelling as this argument is, it can only explain why acts of cooperation and mutual aid are “useful,” but never why they’re “right.” When we say that something is “right,” we intend something different than saying that it’s beneficial for survival. We rescue that child drowning in the well, not because we hope others will do the same if it were our child, but because it’s the “right” thing to do. Moral underpinnings that emphasize reproductive fitness take us only so far. We need an explanation for “rightness” that goes beyond social and biological utility. For example, the history of our own culture suggests an evolution in moral values marked by a gradual process of inclusion of “others” onto the list of those to whom moral duties are owed, e.g., people of color, women, infidels, homosexuals, transexuals, unborn children, cetaceans, primates, elephants, endangered species, factory farmed animals, and so on. This gradual extension involves the spread of a standard of rightness that’s utterly divorced from in-group fidelity and reproductive fitness. It marks, in fact, the slow abolition of the very distinction between in-groups and out-groups, a distinction that’s necessary for any successful genetic account of evolution. While the spread of this evolving morality may eventually save us from extinction by nuclear holocaust, climate change, or some other unforeseen Anthropocene disaster, its salutary effect for our future can’t account for its present-day emergence. Evolution doesn’t permit the future to influence the present or the past. But if science as currently construed is incapable of giving a coherent account of the-way-things-are that includes what we know best and most intimately, namely consciousness, purpose, value, and meaning, and if we’re no longer capable of or willing to believe in a Deity, what options are left to us? I want to address the question of whether Buddhism can provide a framework in which moral statements can again make coherent sense. In doing this, I’m not claiming any superiority or exclusivity for a Buddhist solution, only exploring whether a Buddhist solution is possible, and if so, what if might be. In a series of provocative essays, David Chapman has recently argued that mainstream Western Buddhism is incapable of providing any such framework. I think he’s wrong, and I see this essay as part of an ongoing conversation about whether and how Western Buddhism can, in fact, address ethical issues. There are a number of possible strands within the Buddhist tradition which might allow for such a solution. The first is the classical Buddhist idea of karma as the determinant of the realms of rebirth and of sila (ethics) as part of the triumvirate of sets of practices (along with meditation and wisdom) leading to liberation and enlightenment. This is an idea that is already present in the earliest known strata of Buddhist thinking as preserved in the Pali canon. In this scheme, moral behavior plays a role in both determining more desirable rebirths and, ultimately, in attaining enlightenment, or freedom from future rebirths. This scheme answers the question of “why behave morally?” with an appeal to freedom from suffering in this and future lives, and to a final release from any and all suffering that is our natural ultimate destination if only we knew it. Actions are moral if they create good karma and lead us towards these ends. This formulation is somewhat problematic for moderns who no longer believe in rebirth and freedom from rebirth, but it retains some attenuated force as a kind of Aristotelian path towards eudaemonia, if not to complete and perfect enlightenment. There are two other strands of Buddhist thought, however, that suggest a different sort of Buddhist solution to the issue of contemporary moral incoherence. The primary Buddhist elements in this second framework are the twin notions of Dependent Origination and the Bodhisattva Path. These are notions that only reach their fullest expression in historically later strands of Buddhist thought within the Indian and Chinese Mahayana traditions. Dependent Origination, especially in its Madhyamaka (i.e., “emptiness”) and Huayan (i.e., “interpenetration”) formulations, emphasizes the process-relational nature of reality. All “things” (I use the word “things” advisably because there are no “things” in this model, only seamlessly interrelated processes, mutually affecting and transforming each other over time) immediately and intimately co-participate in the emergence of each moment of reality. Dependent Origination implies that the human qualities of consciousness, reason, and value are inherent in Nature, the outgrowth of the integral functioning of the universe, and not simply ghostly flukes residing somewhere between our ears and behind our eyes. The Bodhisattva Path offers a telos, a final end, for us and Nature: we’re here to help all beings awaken, and because of Dependent Origination, the whole of reality supports us in this endeavor. It’s not just our endeavor, it’s the Universe’s. As the 13th Century Japanese Buddhist monk Eihei Dogen might say, “earth, grasses and trees, fences and walls, tiles and pebbles” co-participate in our enlightenment, our enlightenment transforming space and time as we co-awaken with the whole of reality. Within this non-dual framework, our purpose is to cultivate wisdom and compassion. It’s this purpose that provides an external standard for judging the morality of actions: Actions that help ourselves and others to actualize wisdom (i.e., the realization of emptiness, impermanence, unsatisfactoriness, non-self, and non-duality) and facilitate mindful awareness, non-harming, compassion and non-grasping are moral. Actions that detract from it are immoral. We instantiate this moral process in all of our activities, e.g., in meditating, raising and educating children, dealing wisely and compassionately with others, being mindful in speech and behavior, exercising restraint in our desires, and so on. In After Virtue (1981), Alasdair MacIntyre argues that morality achieves coherence through embeddedness within a cultural matrix of supporting practices, narratives and traditions. Buddhism happily provides all three. Unfortunately, these general Buddhist principles fail to provide a means for resolving conflicts between specific moral intuitions. What if, in saving the baby drowning in the well, we’ve saved the baby Hitler? What if a compassionate action helps one person but disadvantages another? What if an act of mercy towards a perpetrator leaves an injured party aggrieved? What if saving an endangered species creates economic hardship for people living nearby? The answers to these sorts of questions often entail a resort to some kind of moral calculus, as if all goods could be measured against each other on the same scale, when in fact they are, often enough, incommensurable. While in Buddhism compassion trumps everything else, the primacy of compassion can’t resolve the question of “compassion towards whom?” when people are differentially affected by actions. All philosophies face this problem of what to do when “goods” conflict. Sometimes we just have to face the tragic implications of how life is structured with something approaching resignation or grace. Buddhist principles can anchor our ethics in a telos, but in and of themselves, can provide only minimal guidance on how to settle these disputes. 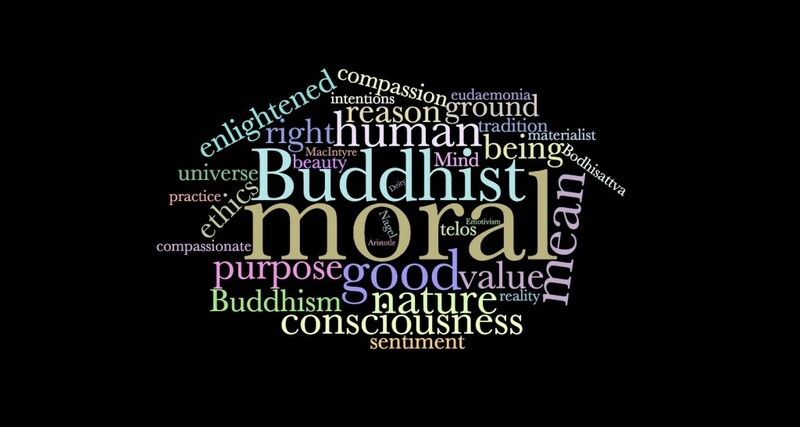 Since Buddhism never developed its own tradition of critical ethical investigation, it may sometimes have to allow non-Buddhist philosophers to come to its aid with their ungainly mix of consequentialist, utilitarian, deontological, and virtue ethics to help think things through. Deciding what’s right is often complicated, but that doesn’t have to mean that the notion of “right” itself needs be incoherent. The problem with this second Buddhist solution is that one has to buy it’s premises for it to work. Not everyone can do so. Materialists, for example, could never buy into the premise that we have a purpose, or that our purpose is part of a larger narrative of everything “waking up.” As a result, Western Buddhism has secular adherents who try to fit significant portions of the Buddhist project into a materialist frame. For secularists, the end point of Buddhist practice is again some version of eudaemonia, and the active Buddhist ingredients contributing to this eudaemonia include elements of mindfulness and compassion. Their answer to the question, “why be mindful or compassionate?” needs be a utilitarian one: it contributes to one’s feeling happier and facilitates one’s capacity to make others feel happier. This probably provides sufficient reason for many people to engage in secularized Buddhist practice; after all, who wouldn’t want to be happier? What it doesn’t provide is a reason why the Buddhist path to happiness is superior to everyone just taking some Valium. The secular response to this requires a theory of why some types of happiness are superior to others, and this requires a theory of what human beings are for, and how they’re supposed to be—just the sort of thing that secularists tend to shy away from. For example, in his book Flourish (2011), positive psychologist Martin Seligman posits a model of eudaemonia that includes the five factors of positive emotion, engagement, accomplishment, relationship, and meaning. It’s not a bad list, but it begs the question of “why these factors and not others?” since it lacks a larger theory of what human beings are for. Seligman defines meaning as “belonging to and serving something you believe is bigger than oneself.” This definition suggests that we’re all free to find our own meaning — that one person’s meaning is as good as another’s, whether one is a Bodhisattva, a Fascist, or an acolyte of the Islamic State. Whatever makes you feel you’re part of some larger story. You can see the inherent problem: we’re left with no way to establish a hierarchy of goodness within the universe of possible meanings. Secularized accounts can never adequately address questions of goodness without grounding the concept in some larger theory of what our lives are all about. That means acknowledging that human lives are, in fact, about something. Everyone, knowingly or not, has a metaphysics. A materialist metaphysics can’t account for consciousness and value, and leaves our lives devoid of meaning. Materialism suggests our lives aren’t about anything — they’re just accidental byproducts of physical processes. Materialism can’t be empirically proven or disproven, any more than pan-psychism or teleology can. It’s just more or less useful, and depending on your point of view, more or less credible. I think the Buddhist story has something special to contribute to our survival as a species. It clarifies our deep interrelationship with all beings and with Nature, clarifies our moral duties towards all beings without exception, and encourages us to move beyond the fragmented individualism and consumer mentality that are the twin scourges of modern Western society. As our fragile species lurches toward the possibility of extinction, we moderns are increasingly the inheritors of a conflicting set of historical grievances and irreconcilable world-views, while simultaneously the possessors of technologies that extend our ability to inflict exponentially greater harm on each other. Our current moral incoherence will not let us muddle through. Something very much like Buddhist ethics seems increasingly urgent if we’re going to make sufficient progress in resolving these conflicts to survive as a species. The Buddhist solution, however, requires us to think differently about Nature and our place in it. It also requires us to assume something very much like the Bodhisattva ideal — the belief that there’s a more enlightened way to be than the way-we-are-now (however we construe “Enlightenment”) and that an engaged, compassionate regard for others is an indispensable component of that enlightened way.